Form No. 4.-100 - 17.8.10. Delivery Date 16 APR 1912. No. 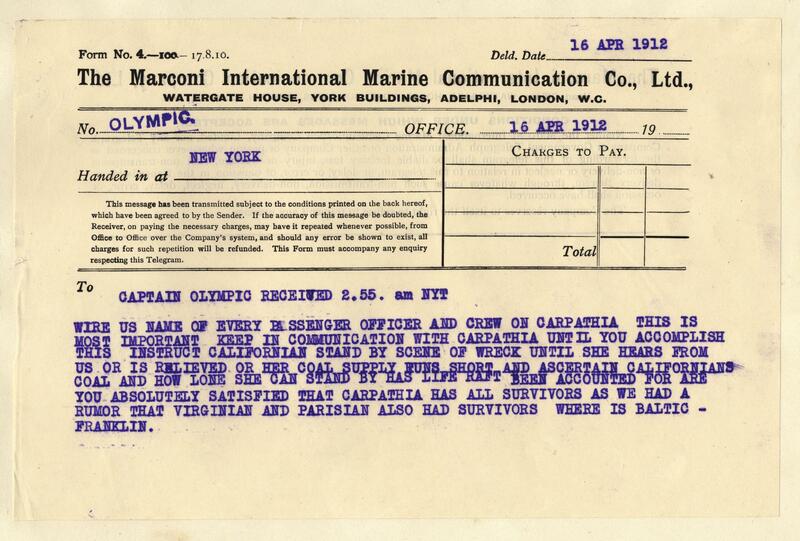 OLYMPIC, Handed in at NEW YORK. To : CAPTAIN OLYMPIC RECEIVED 2.55. am NYT. WIRE US NAME OF EVERY PASSENGER OFFICER AND CREW ON CARPATHIA THIS IS MOST IMPORTANT KEEP IN COMMUNICATION WITH CARPATHIA UNTIL YOU ACCOMPLISH THIS INSTRUCT CALIFORNIAN STAND BY SCENE OF WRECK UNTIL SHE HEARS FROM US OR IS RELIEVED OR HER COAL SUPPLY RUNS SHORT AND ASCERTAIN CALIFORNIANS COAL AND HOW LONE SHE CAN STAND BY HAS LIFE RAFT BEEN ACCOUNTED FOR ARE YOU ABSOLUTELY SATISFIED THAT CARPATHIA HAS ALL SURVIVORS AS WE HAD A RUMOR THAT VIRGINIAN AND PARISIAN ALSO HAD SURVIVORS WHERE IS BALTIC - FRANKLIN.